This is a summary of an article published on pharmtech.com and printed in the Solid Dosage Drug Development and Manufacturing supplement in Pharmaceutical Technology, March 2018. In the article, Nicola Tirelli, Professor and Senior Researcher at the Laboratory of Polymers and Biomaterials, Italian Institute of Technology, explains how variation in drug-loaded polymer nanoparticle synthesis is reduced with flow chemistry, compared to traditional batch chemistry techniques. Targeted nanoparticle-based drug delivery offers a number of benefits over conventional treatment options, and nanoprecipitation is the most common method for creating these nanoparticles. Traditionally, nanoparticles produced using nanoprecipitation have been produced in 3-stage batch chemistry processes. These batch processes offer the benefit of producing a large volume in a short time period and are easy to setup at production scale. This simplicity is also its biggest disadvantage; perfectly reproducible mixing is difficult to achieve in batch techniques. 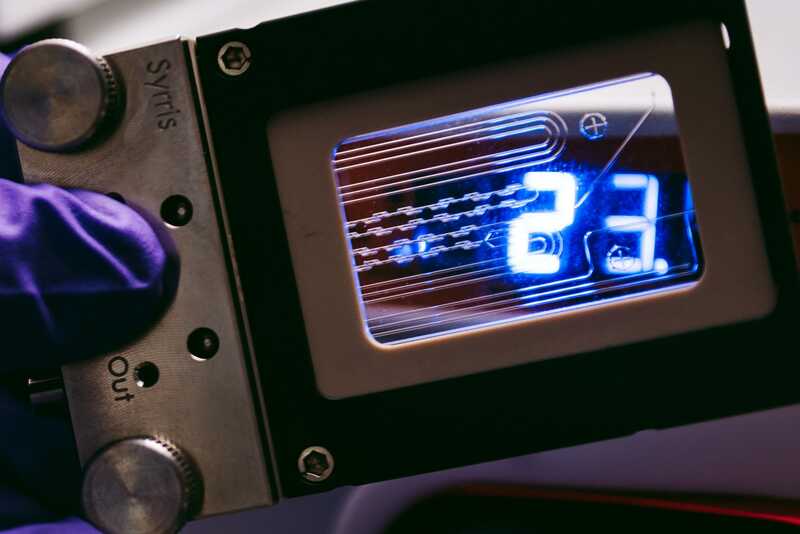 In contrast, flow chemistry systems, such as the Asia flow chemistry range, offer slow, highly controlled mixing through microfluidic chips, producing consistent nanoparticles. Scale-up can be achieved by running multiple chips together or eventually scaling up with production scale flow reactors, such as Titan. Nicola Tirelli concludes that the future of drug delivery nanoprecipitation likely lies in flow chemistry techniques, but we can’t downplay the importance of batch processes. Read the full article on pharmtech.com for a detailed breakdown. The Laboratory of Polymers and Biomaterials, Italian Institute of Technology, is a Syrris customer and uses the Asia flow chemistry system to perform their research and development of nanoparticles. N. Tirelli, “Improving Nanoprecipitation Control,” Pharmaceutical Technology Solid Dosage Drug Development and Manufacturing Supplement (March 2018).